Eythylbenzene dehydrogenase is a heterotrimer of three subunits that catalyses the anaerobic degradation of hydrocarbons. The alpha subunit contains the catalytic centre as a Molybdenum cofactor-complex. This removes an electron-pair from the hydrocarbon and passes it along an electron transport system involving iron-sulphur complexes held in the beta subunit and a Haem b molecule contained in the gamma subunit. The electron-pair is then subsequently passed to an as yet unknown receiver. The enzyme is found in a variety of different bacteria. This entry represents a haem-binding domain found in cytochromes b558/566 (subunit A), c-551 and c-552, as well as in members of the type-II members of the microbial dimethyl sulphoxide (DMSO) reductase family. The DMSO reductase family is a large and rapidly expanding group of enzymes found in bacteria and archaea that share a common form of molybdenum cofactor known as bis(molybdopterin guanine dinucleotide)Mo [(PUBMED:15311335)]. In addition to the molybdopterin subunit, these enzymes also contain an iron-sulphur subunit. These include two distinct but very closely related periplasmic proteins of anaerobic respiration: selenate reductase and chlorate reductase [(PUBMED:15866716)]. Other proteins containing this subunit include dimethyl sulphide dehydrogenase and ethylbenzene dehydrogenase [(PUBMED:11294876), (PUBMED:12067345), (PUBMED:16030201)]. One member of the DMSO reductase family is eythylbenzene dehydrogenase, which is a heterotrimer of three subunits that catalyses the anaerobic degradation of hydrocarbons (alpha, beta and gamma subunits). This entry matches the gamma subunit, whose structure is known [(PUBMED:16962969)]. The alpha subunit contains the catalytic centre as a Molybdenum cofactor-complex. This removes an electron-pair from the hydrocarbon and passes it along an electron transport system involving iron-sulphur complexes held in the beta subunit and a Haem b molecule contained in the gamma subunit. The electron-pair is then subsequently passed to an as yet unknown receiver. The enzyme is found in a variety of different bacteria. There are 1002 EB_dh domains in 995 proteins in SMART's nrdb database. Taxonomic distribution of proteins containing EB_dh domain. This tree includes only several representative species. The complete taxonomic breakdown of all proteins with EB_dh domain is also avaliable. Click on the protein counts, or double click on taxonomic names to display all proteins containing EB_dh domain in the selected taxonomic class. Crystal structure of ethylbenzene dehydrogenase from Aromatoleumaromaticum. Anaerobic degradation of hydrocarbons was discovered a decade ago, andethylbenzene dehydrogenase was one of the first characterized enzymesinvolved. 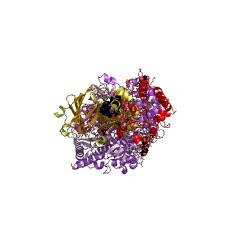 The structure of the soluble periplasmic 165 kDa enzyme wasestablished at 1.88 A resolution. It is a heterotrimer. The alpha subunitcontains the catalytic center with a molybdenum held by twomolybdopterin-guanine dinucleotides, one with an open pyran ring, and aniron-sulfur cluster with a histidine ligand. During catalysis, electronsproduced by substrate oxidation are transferred to a heme in the gammasubunit and then presumably to a separate cytochrome involved in nitraterespiration. The beta subunit contains four iron-sulfur clusters and isstructurally related to ferredoxins. The gamma subunit is the first knownprotein with a methionine and a lysine as axial heme ligands. Thecatalytic product was modeled into the active center, showing the reactiongeometry. A mechanism consistent with activity and inhibition data ofethylbenzene-related compounds is proposed.